In Switzerland, the time between Christmas and New Year is called “Feschttage,” which I guess could loosely translate to “holidays.” I prefer to think of it as “festive days.” In that spirit, as a bright burst into the New Year, I present to you the work of a painter I find Amazing (yes with a capital A): Linda Besemer. Like many of the artists I show you, she is a true original. Abstraction, Hard Edge, Minimalism, her work covers it. My take on her work— as a painter—is a love of color. Too bad some artists like Mondrian didn’t include more color in their minimalist work! Besemer’s work is an exploration of pure color and the very nature (plasticity and physicality) of the two-dimensional painting medium. Her works challenge traditional ideas about art, and even abstraction itself. Without the benefit of support of any kind, Besemer creates sheets of pure acrylic paint with patterns on both sides. 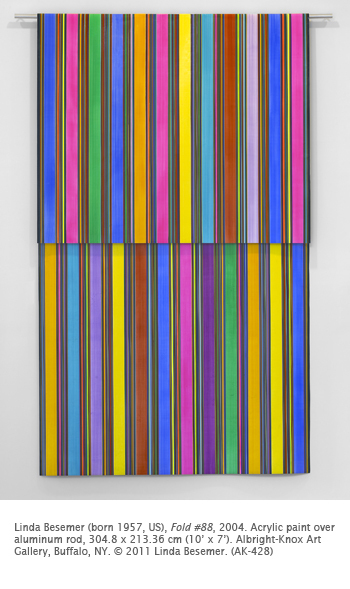 Like this one, they are often draped over an aluminum rod, further confounding the strict definition of “painting.” In her assertion of the medium itself as subject, Besemer follows a distinguished line of feminist artists starting in the 1970s whose work shatters the perceived boundaries of fine art. Besemer’s process involves painstaking precision so that preferred colors are juxtaposed with one another after the fold. She applies thin skins of acrylic paint on a sheet of glass, peeling it off after it dries. The paintings in her fold series are inevitably dynamic tour-de-force of hard-edge compositions, although the contrast of the front and back patterns introduces the perception of space and of the paint as a three-dimensional object. This is a total reinvention of the concept of the picture plane! Besemer received her BA and MFA at Indiana University and Tyler School of Art. She teaches at Occidental College in Los Angeles. 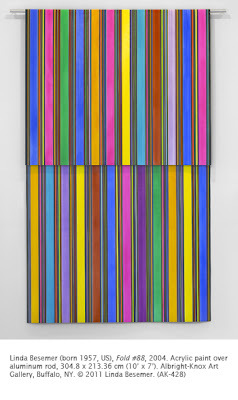 In recent works, she has introduced curving lines creating an Op Art type of visual movement. Activity: Create a nonobjective artwork with either Organic lines and shapes or geometric lines and shapes that expresses a mood. Draw several large shapes first. Add more lines and shapes to create a feeling of mothion. Add color to embolden the message of the work. Actually I love this pre-Christmass time. And I believe it bears magic in any country! So many joy and happiness and all the lights and all the events! Wonderful time.